PowerBright-Laser: Special high-performance laser diodes project extremely visible laser lines. 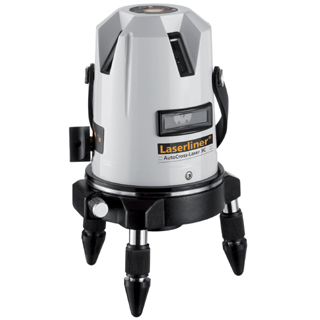 This unit produces 3 very visible laser lines which make it outstanding for the alignment of tiles, wall studding, windows, doors, etc. RX-Ready: The integrated hand receiver mode detects the laser lines with the optional laser receiver RX up to a max. of 50 m radius – ideal for all interior and exterior applications. The pivoted housing can be turned with a vernier adjustment mechanism to permit exact positioning of laser lines. Illuminated vial and height-adjustable feet for preliminary adjustment of the unit.